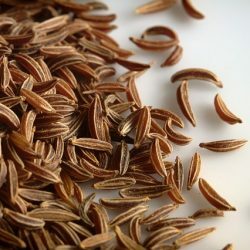 Caraway seeds have a spicy, slightly anise tinged flavor, that is often used in rye breads (so much so that some people think of this as the flavor of rye) and the Scandinavian spirit Aquavit. Its popularity in gin often is tied to Aquavit, as both are herbal spirits which often feature some of the same botanicals. Closely related to cumin and coriander, it like many ingredients in gin has a long history as both a spice in food and as a medicinal herb.